Being a full time or part time working parent is a tough situation. You want to be there for your newborn infant as much as possible and share in the joy of growing up, but you also want to be able to provide for them and save for their future. Many families and parents are locked in the circle of this parental paradox, especially in today’s economic climate. And many parents find that enrolling their child in an infant child care program is the best option for their child, their future and their finances. If you decide that child care for your infant is an option, you should know about the benefits that your child will get from the program. The benefits of infant childcare encompass the full spectrum of child development. Quality infant child care programs will focus on four main areas of child development. Sensory Motor Development includes large and fine motor skill development. Large motor skills include balance, motion and, as the child develops, crawling and walking. Fine motor skills include finger and hand grip strength and object manipulation. Language Development is the developmental stages of speech acquisition. It is facilitated by infants listening to people speaking. Infants will move from crying to babbling to pronouncing a few prominent words. Social-Personal Development is the development of the infant’s sense of self. This is aided by interaction with other children. Cognitive Development is the development of the ability to play games and follow simple instructions. A quality infant child care program will be designed to foster and aid the development of all these skills. While most infant childcare programs are safe, they are not all created equal. A childcare program that is accredited or whose caregivers have received a Child Development Associate Credential is required to submit to a rigorous set of training and facility standards over and above those required by the state or local regulations. One of the most important factors when considering the safety of an infant childcare program is the child to caregiver ratio. This ratio is considered to be one of the best predictors of both the safety and quality of the childcare program. A high quality credentialed infant child care provider will make sure that the caregiver to child ratio is in alignment with the childcare practices. 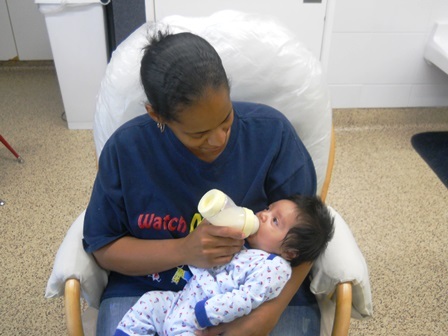 At Watch Me Grow North Las Vegas, our professional, caring infant child care staff are dedicated to making your infant’s child care experience as safe and beneficial as possible. The First Impressions infant child care program is designed to give your child a great first child care in a safe and loving environment. The low caregiver to child ratio ensures both the quality of the program and the safety of the child. For more information, come check out our quality programs and contact us today. We look forward to hearing from you!